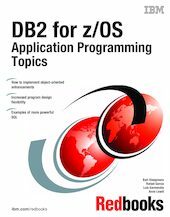 This IBM Redbooks publication describes the major enhancements that affect application programming when accessing DB2 data on a S/390 or zSeries platform, including the object-oriented extensions such as triggers, user-defined function and user-defined distinct types, the usage of temporary tables, savepoints and the numerous extensions to the SQL language, to help you build powerful, reliable and scalable applications, whether it be in a traditional environment or on an e-business platform. IBM DATABASE 2 Universal Database Server for z/OS and OS/390 Version 7 is currently at its eleventh release. Over the last couple of versions a large number of enhancements were added to the product. Many of these affect application programming and the way you access your DB2 data. This book will help you to understand how these programming enhancements work and will provide examples of how to use them. It provides considerations and recommendations for implementing these enhancements and for evaluating their applicability in your DB2 environments.